CL100 series has basic function of AC current measurement. These clamps allow you to measure current range from 20mA to 1000A. Choose your desired diameter of measurable conductor from 24mm to 54mm. CL200 series has basic function of AC/DC current measurement. These clamps allow you to measure current range from 40mA to 2000A. Choose your desired diameter of measurable conductor from 24mm to 55mm. CL300 series and 30031 have basic function of leakage current measurement. 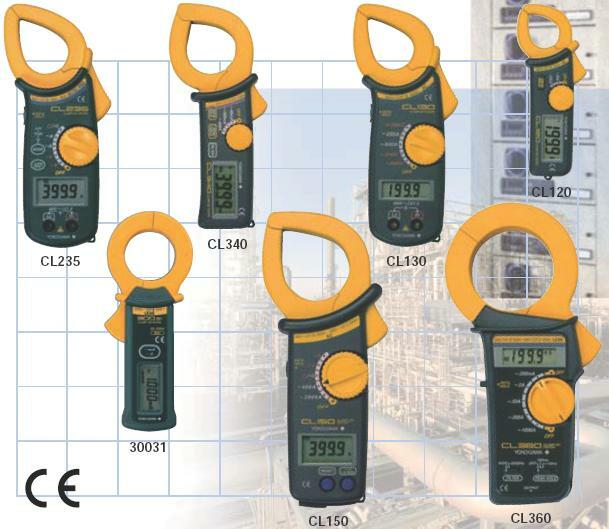 These clamps allow you to measure current range from 3mA to 1000A. Choose your desired diameter of measurable conductor from 24mm to 68mm. For further information on these products, please see the following brochure.